Containing more than 1,500 sea and land creatures, the Istanbul Aquarium (Akvaryum) has a rich and diverse collection of aquatic life from 16 geographical zones. With interactive exhibitions in English and Turkish, overhead shark tanks, multiple cafés, and a 5D movie theater, there is enough in the aquarium to entertain the family for hours. More than 60 water tanks contain aquatic animals from the Red Sea, Pacific Ocean, Panama Canal, Aegean Sea, and elsewhere. Highlights of the aquarium include sting rays, sharks, caiman crocodiles, and a rain forest zone with poison frogs. All the exhibitions have information about the culture and history of each region, plus information about the fish and other life on display. The Istanbul Aquarium is a must-visit for marine animal lovers, nature buffs, and families with children. Aquarium admission tickets, which provide access to all the exhibits and movie theaters, can be purchased in advance and delivered to your hotel. There are three cafés and a restaurant in the aquarium. The aquarium is accessible to wheelchairs and strollers. The Istanbul Aquarium is located in the Aqua Florya shopping complex, in the Bakirkoy neighborhood. You can take a metrobus, city bus, or metro to Yenibosna; the Marmaray underwater metro line to Kazlicesme; or a taxi straight there to the Aquarium. The aquarium is open from 10am to 8pm daily. Turkish and religious holidays can affect opening hours, so check online ahead of your visit. The aquarium can get busy in the afternoon, so arrive earlier in the day to avoid the crowds. The Istanbul Aquarium contains a large collection of fish, sharks, and other water animals. Look out for the balloon fish, the cownose rays, sand tiger sharks, red belly piranhas, and spotted garden eels. There are also gentoo penguins from the South Pole and capybara rodents, which hail from South America. Easily visit the Istanbul Aquarium with admission tickets delivered directly to your hotel. The aquarium has a large number of fish varieties from many different regions. Learn about sea life through interactive games, movies, and visual graphics. If you prefer, you can collect your tickets from the local operator’s office. Glimpse into the underwater world of the Istanbul Aquarium on this 5-hour tour, plus check out one of the largest shopping complexes in the city. Visit the Aqua Florya and discover an aquatic paradise consisting of 16 marine environments, more than 1,500 species and interactive demonstrations at every turn. You will stroll inside shark-laden hideouts, stare at the undersides of stingrays and sea turtles and ogle exotic frogs and feisty piranhas. Then, at your leisure, enjoy all your senses at a 5D movie house (own expense). End your day indulging in some light shopping or lunch within the mall (own expense). 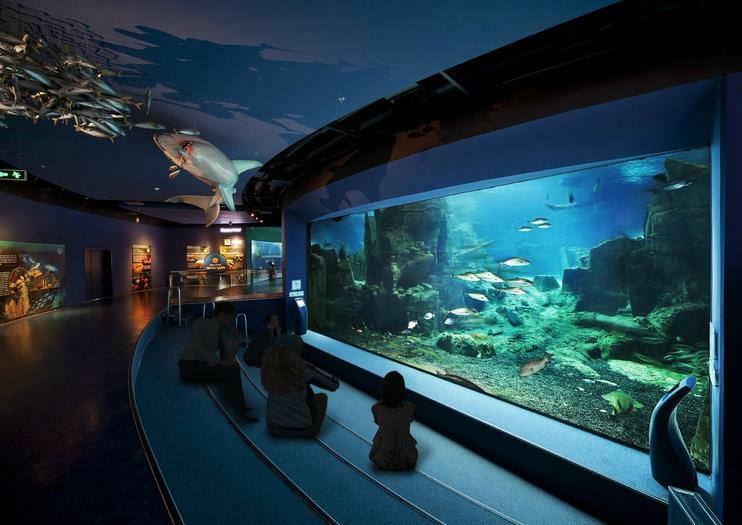 In comparison to other aquariums of its class containing fish species living in the world’s seas, it is the newest with its travel route, thematization, interactivity, rainforest and cutting-edge technology.Istanbul Akvaryum holds a leading position among worldwide aquariums thanks to its volume, variety of fish species, and the activities on travel routes. It is a project which makes ‘firsts’ and ‘mosts’ in its field.